Although I was posting fun pictures all over my social media channels, I was in attendance at the We All Grow Summit this weekend to improve my blog/brand and make new connections. I prepared for the weekend with a list of needs. I researched the agenda, the speakers/bloggers and pinpointed what I wanted to extract from workshop sessions. Call me an over planner but I wanted to make the most out of this opportunity! 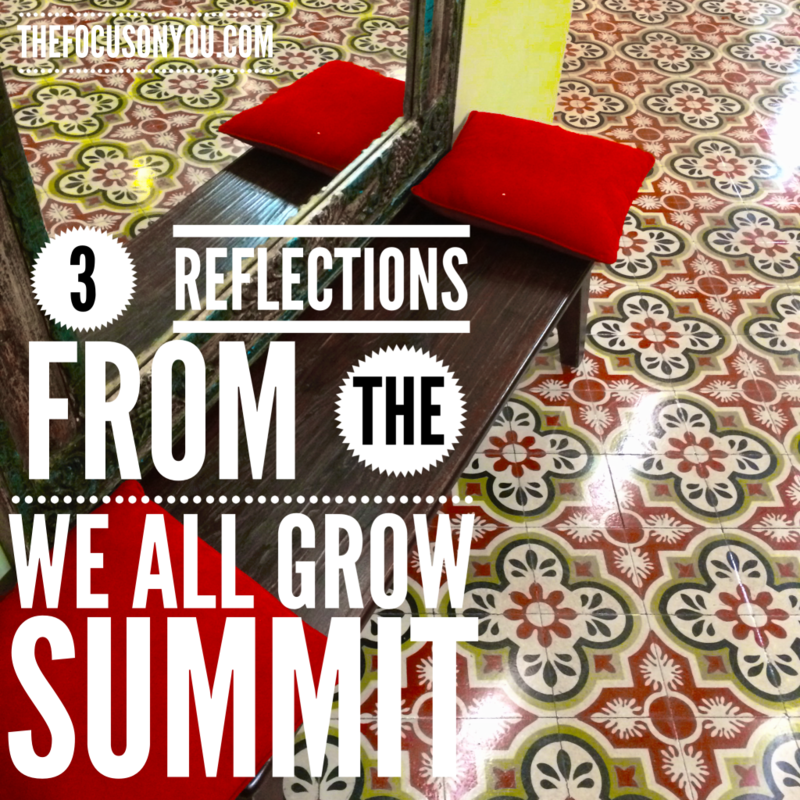 I narrowed down my reflections from the conference and realized these are NOT exclusive to just media influencers, bloggers or social media pros. Media can be TOO powerful – Rosie Rivera provided a powerful testimony about her family losses, personal battles and her book, Mis Pedazos Rotos, detailing how she is healing from the wounds of childhood abuse. Rosie admitted to a room full of bloggers and media influencers that she hates media because it’s keeping us uneducated. She believes that our voice can be used in a more influential manner. Reflection: Serve a purpose with every post, picture and retweet. Educate and help someone. You don’t have to be a blogger or professional to be an “influencer.” Bullies are influencers too but look at the damage they cause. Change the conversation. Our Power Is In Our Voice – The world doesn’t know that it needs you. Click To Tweet What can you provide to build someone up? Is there a story you want to share? Be more real. As Rosie Rivera stated, “When you are YOU the audience will come.” Reflection: If ideas keep floating in your head, put them on paper. State them out loud. Write them in your journal. During this conference I stated my future intention to a new friend. Ironically, she had the same thought. We shook hands and agreed to meet each other in that future place. Now we just allow the Universe to work its magic! Evaluate The Energy Around You – Two of my biggest highlights were the Wellness Circles I attended both days of the conference. On the 1st day I was blessed to have personalized attention with Elayna Fernandez of The Positive Mom. She helped me solidify my passions so they could be timeless and more specific. The 2nd day I shared my visions with Hiliana Devila and Christine Gutierrez. They honored, challenged and comforted our group to move forward on whatever was holding us back. Reflection: Step back and look at how you are operating. If you are a blogger or entrepreneur, how is your audience viewing you? What are they seeing on your timelines, website, email signature, video content, etc.? What energy are we bringing? If you are busy with family life, step back and re-evaluate your routine. How often are you speaking comforting words to your children or loved ones? Are your words full of criticism or rushed? What do your children see when they see you everyday? What does your boss see when you walk in everyday? The energy you bring into a room, your house or your office could help explain why love or opportunities are not opening up for you. Christine recommended for bloggers/vloggers to take a social media break to give their brands a fresh eye. Unconsciously we end up repeating patterns that we see. We take the same Instagram picture or create the same type of video. I have mentioned this in previous posts relating to toxic energy. What news or conversations are we hearing? How is this being reflected on our thoughts or conversations? I could probably write a book on all the lessons I learned through these last few days. One thing that I do know is that the title of this conference truly reflects how I feel: We All Grow. Thank you for helping me grow Latina Bloggers Connect! If you attended the conference this weekend what takeaways did you have? What energy will you bring to this week? I love these reflections, and I am honored to be a part of your journey. I look forward to keeping in touch and collaborating together. You are amazing and I am so happy that I finally got to meet you! Elayna, I am so humbled by your kind words! I love our new tribe! We’ll definitely stay in touch! It was great meeting you love! thanks for writing and sharing your experience and so glad you enjoyed our wellness circle! was so much fun connecting with you and all the fabulous ladies at we all grow! Thank you for reading and commenting on my post Christine! I have pages and pages of notes and couldn’t condense it all! The Wellness Circles were definitely my highlights though. Keep sharing your positive energy Diosa! Thanks for sharing. I enjoyed the way you presented what you learned. You just reminded me that I have to state my intention and move forward and to write it down in place where I can look back a year from now and see what happened…. Here is to next year’s @weallgrow! Thank you for commenting Maritere! I’m pleased that you enjoyed this post! We will all be anxiously awaiting to buy tickets for next year’s Summit! Do you have a vision board or intention board?